AFTER a few Killer Hills in Lancashire, we were thinking it was high time that we left our comfort zone and tackled a genuinely nasty climb. When I say ‘we’, I mean that the editor suddenly had all sorts of pressing engagements on the chosen weekend in December (something about a tree… or hiding behind one) and it was left to muggins to go find something silly to climb. Outside the comfort zone? Must be North Wales then. For me, one of the least comfortable times to ride hills is just before Christmas, when my training has become the equivalent of ‘bringing games in to school’ day. I wasn’t totally daft. 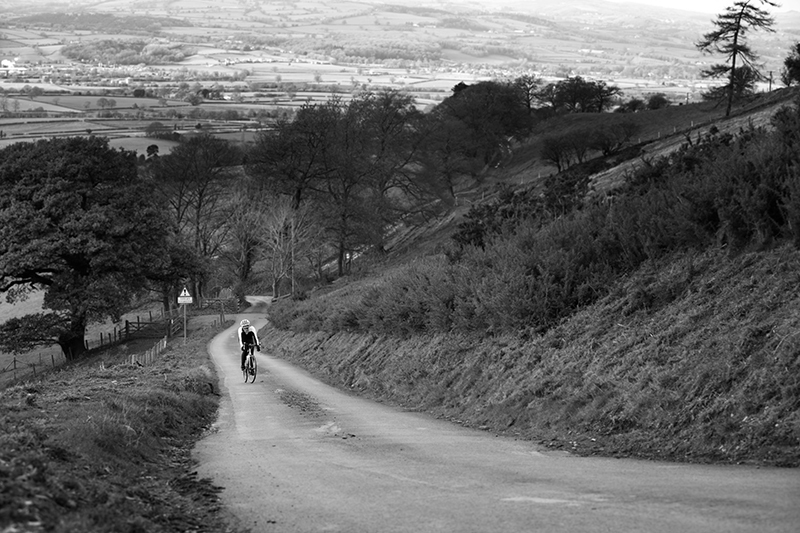 I had the bright idea of riding the two chosen climbs in private and then photographing better climbers on them. When the going gets tough, the tough call in women. 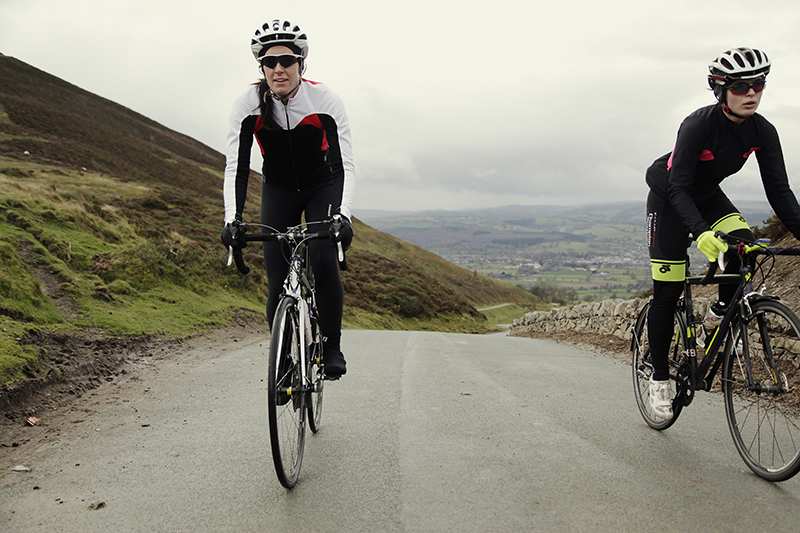 Heather Bamforth and Joanne Blakeley, who was ninth in last year’s National Hill Climb, were as fit as fleas and eager to star in Killer Hill, so we agreed to meet in Ruthin and climb a couple of legendary routes. The A494 between Ruthin and Mold features a hill. 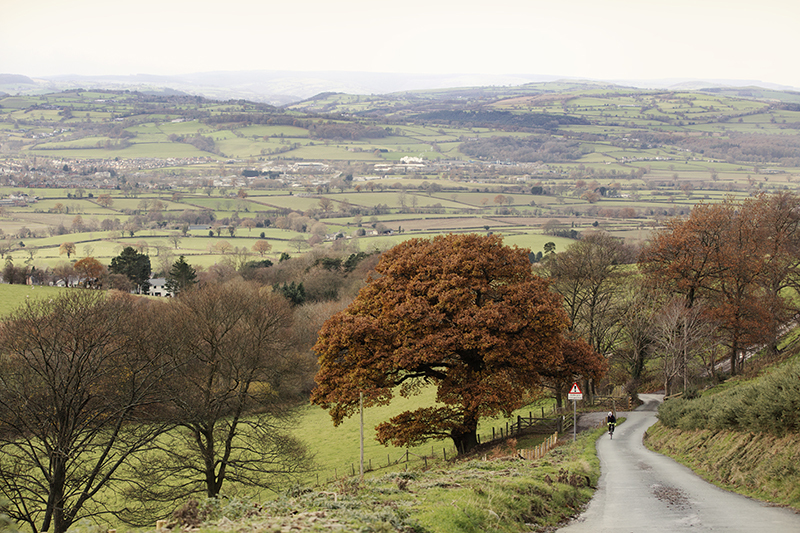 It’s a great big hill, part of the Clwydian range with the whole of Welsh creation – mainly green fields, sheep and craft shops – laid out below, as you descend into Ruthin. There’s even a genuine continental style hairpin – just the one mind – near the bottom, nestling amongst bungalows named, in that weird Welsh way, after places like ‘Tahiti’ and ‘Tahoma’. You have to assume they’re twinned with bungalows named ‘Llanberis’ and ‘Mold’ in exotic palm tree places. Meanwhile, the A494 climb is busy with Bennies in skirted Clio’s and fair few cyclists twiddling their way up the two mile hill – the latter dreaming, no doubt, of longer, warmer and Bennie free cols on the continent. Why did I mention the hairpin earlier? 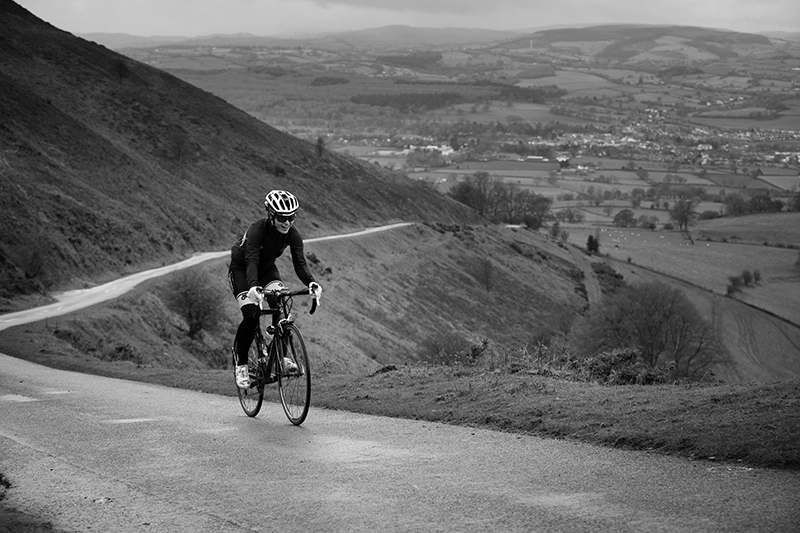 Well, it features a side road to a climb that is one of the top five worst climbs in the UK. Let’s be honest, there’s an awful lot of exaggeration amongst cyclists about the difficulty of climbs. We hold up our hands, too. We’ve been guilty in the past of using too much doom-laden prose and dramatic guff or exaggerating the unpleasant experience of having to use bottom gear for more than three minutes into a epic struggle between ego and idiocy. “And you’re about to do it again…” I can hear you thinking. Not this time. All I can do on this occasion is to write down – in clear and unemotional terms – what happened. Think of it as having all the poetic licence of a Police constable consulting his notebook on the witness stand. I’m just giving you the facts. After a restless night’s sleep, at approximately 8.30am on December 12,, 2013, I approached the suspect climb from a westerly direction. I felt little apprehension at this point. I did realise that the two mile ride from Ruthin town centre wasn’t a thorough warm up. However, M’Lud, the sun was out, I had the wind at my back and I was riding my winter bike equipped with a 34:29 ratio group set. 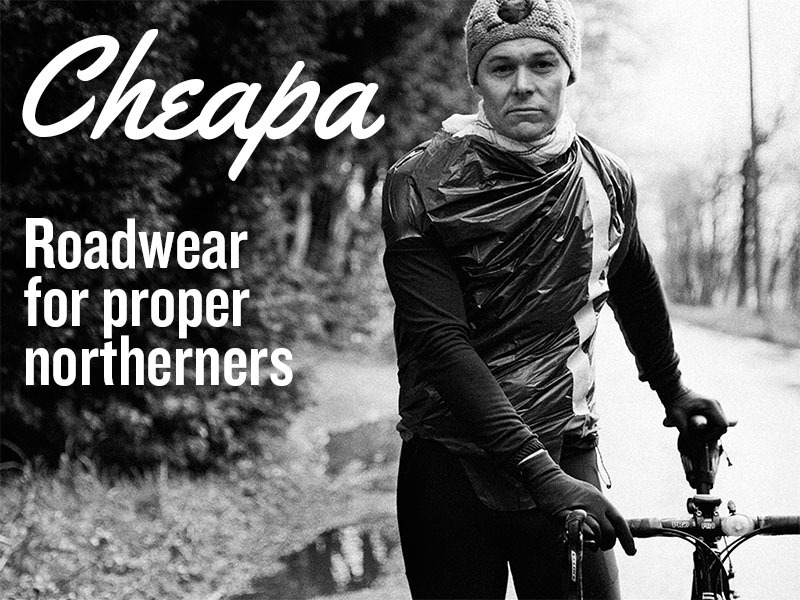 I was also sporting my Rapha Pro Team jacket and over socks. I felt that I looked – to quote the vernacular – ‘the business’. I was also working on the assumption that Simon Warren, author of 100 Greatest Cycle Climbs, was just joking when he sent me a tweet consisting mostly of exclamation marks when I told him we were going to take a look at Penbarras. I had also dismissed the cover photo of his book, which features the Penbarras Hairpin. To my eyes, it had obviously been over-egged or taken from a silly angle to make the road look steeper than it actually was. Aren’t all hill climb descriptions 60 per cent accurate information and 40 per cent dramatic varnish? How bad good this climb really be? Turning off the single hairpin on the main road, the route winds past a few houses and a couple of farms. Then it breaks out onto open hillside and winds it’s way up to meet Offa’s Dyke at the neck of the pass and a Forestry Commission Carpark. Bereft of a café and with just a few people dressed in beige milling about and tutting that they’ve driven up to find no coffee and cake reward for their efforts behind the wheel, it’s a bleak spot in winter. In retrospect, I still cannot believe the suggestion that this was once the main road across to Mold. If it was, I can imagine Ruthin not knowing of the existence of Mold until 1936. According to the statistics, the road gains 853-feet in altitude in just under a mile-and-a-half. Not good, but it gets worse. Most of this gain is front loaded. What started out as a little bimble along a leafy lane for a couple of hundred yards, soon kicked up into a narrow lane with barely a gear to spare and dragged ever upwards, sapping my legs as I went. I don’t know about you, but when I climb my minds constantly monitoring my reserves: imagining my legs are like two transparent fuel tanks that I can see the precious energy draining from if I look down. Assessing choices of gears and breathing,I start to keep tabs on my position and pull ‘n’ push – looking for a way of relaxing my effort and retaining as much energy as I can. This lane was costing me dear already and I was in constant fear of meeting a car coming down that would force me to slow down so much I’d have to stop. Unfortunately for me, the end was not in sight. It had already been a bad climbing experience and the road further ahead was just preposterous – a 200-yard steep ramp with an even steeper left hander and then more steepness. It made up so much height in such a short stretch that it would barely function as a farmer’s track – let alone a public road. Farmer Jones might get up it in a lightweight Land Rover on a dry summer’s day, but only if Rex, his collie dog, walked alongside – or pushed. Crossing the cattle grid, I realised the right-hand fork leads to what must be known as ‘Chortle Farm’ and the road ahead is, literally, going to take me – very brutally – to a whole new level of climbing. Oh dear – or words to that effect beginning with ‘F’. I’m not sure what the gradient was at this point. It’s said to be ‘approaching 25 per cent’. If so, it’s approaching 25 from the wrong side. I was already in the state where I realised that I had to drastically get a grip on my breathing. After barely two minutes on this climb, I had no gears left, no chance of sitting down without the front wheel lifting off and, if I didn’t manage what pitiful resources that I had left, I was not going to make the hairpin in front of me – let alone get around it to the top of the climb. Let me be clear here – it is not a hairpin. A hairpin bends back on itself with a wide outer edge you can choose to take as an easy option. I’m sorry, but this corner is a simple 90-degrees. I can’t slip around it using the outer arc option, as it’s steep on both edges. The camber seems to stretch across the whole width of the road. Instead, I’d have to turn up it and cling on to the top. I didn’t. At this point, I could feel both heart and lungs reaching for the big red ‘bail out’ button. Also, I had a newspaper headline flashing through my brain saying something along the lines of ‘MAMIL found dead on Welsh Hillside still clipped onto his bike’. I stopped. There you have it, I did the one thing that no cyclists likes to admit. Trust me, if you climb this monster and weight more than eight stone wringing wet, then you’ll stop too. After managing to unclip on the gate entrance right on the corner, my pulse hammered away at shuttle launch velocity and that’s when the good old self justification process kicked in. Of course, I’d had to stop – obviously in order to take a snap for the Twitter feed, to examine the road surface and was that an important text that had pinged in my back pocket? Heart-rate managed, the gate entrance gave me just enough launch distance to push on up in bottom gear – from 90rpm to 30rpm in just two metres – and, as the road dropped off to a lame 17 per cent, then a frankly pathetic 15 per cent and finally flat, stage two of denial kicked in. I marshalled all the extras excuses that winter weight and lack of fitness demand – winter bike, gear slippage, wrong time of year, blah-blah-blah. To be honest, I may have to add ‘wrong time of life’ to that. 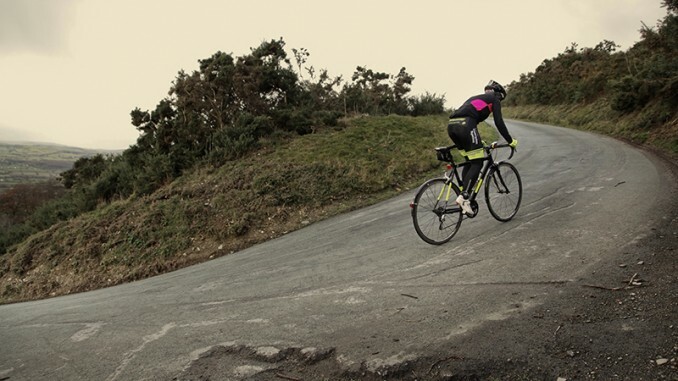 To be fair, I reckon the bottom section of the Bwlch Penbarras would be difficult for Chris Froome to race up on my winter bike after just a two mile warm up. Ever see Team Sky training on Penbarras? No. There is a good reason for that. Thankfully, the remainder of the climb up the valley to the top was fine. There was a patch of steepness at the crest, but it was nothing compared to what I’d just experienced down the road and around the corner. To be frank, the whole experience had been ruined by my schoolboy start. I felt like someone had punched me in the face and was now patting my back, trying to buy me a drink. No. Leave me alone…I’m not happy with you. The next day, I managed to get the car up the climb. Were those paw prints on the boot, I wonder? Near the summit, I waited to see how Jo and Heather managed the climb. Now, here is the thing….Jo, she won’t mind me saying this, makes quite a loud panting noise as she climbs. She’s not in trouble – it’s just her style. I could hear her steady rhythmic breathing long before I saw her. Both girls were definitely being tenderised by the pre-climb ‘climb’ up the leafy lane to the cattle grid. Ah yes, both of them seemed to falter slightly over the cattle grid when they saw me up ahead. Damn them though – both were definitely making more speed than I had. Joanne made it first time around the corner, but Heather wasn’t so lucky. A car was making its way down. I made the mistake of suggesting she stopped – so that I didn’t get the car in the frame as well. Heather suggested ‘quite loudly’ that stopping was not an option. I have to say that, for a lady, Heather seems to know an awful lot of swear words and I was impressed that she had enough breath to deliver them all as she passed. There is a crumb of good news for you all concerning the Bwlch Penbarrass. A couple that I know have just bought the first house on the right past the dreaded ‘hairpin’. It’s a long, low bungalow with fantastic views over the valley. They are not cyclists themselves. To be honest, as a Cumbrian petrol head, one of them has often found cyclists to be a bit a of a nuisance. However, they have now realised that they live right next to one of the worst cycling climbs in the country and have developed a respect for the poor deluded souls attempting the climb. During the summer, I’ve suggested they should put up a sign before the corner as a kindness – offering tea and cakes on the roadside. Maybe a defibrillator wouldn’t go amiss either. Dan is currently lying down in a dark room burbling about going back, a stone lighter, on his summer bike. It is tough. No doubt about it but it’s a cracking climb. Foot down. Live right next to this and do it probably 3-4 times a week. There’s a far worse climb on the ‘old horseshoe pass’ which you should definitely do an article on if you thought that Bwlch Penbarras was bad! Cav flew up it during his sportive last year so it shouldn’t hold too many worries for Froomedog!